Heute ist es so warm, dass ich euch ein richtiges Frühlingsoutfit zeigen kann. Das erste Mal muss ich keine dicke Jacke tragen. Ich trage eine weinrote Vintage Jeans mit hohem Bund. Ich mag diese Karottenform sehr gern. You look absolutely perfect!!! love your red pants, i am your newest follower, i hope you follow me back. Lovely look, the red trouser is beautiful!! I would love for you to check out my blog and maybe we can follow each other? Thanks for your comment and following my blog. Follow you now on GFC. Let me know if you want to follow on bloglovin too. Keep in touch..
Love the photos, your pants are a must!! Hi dear, how are you? 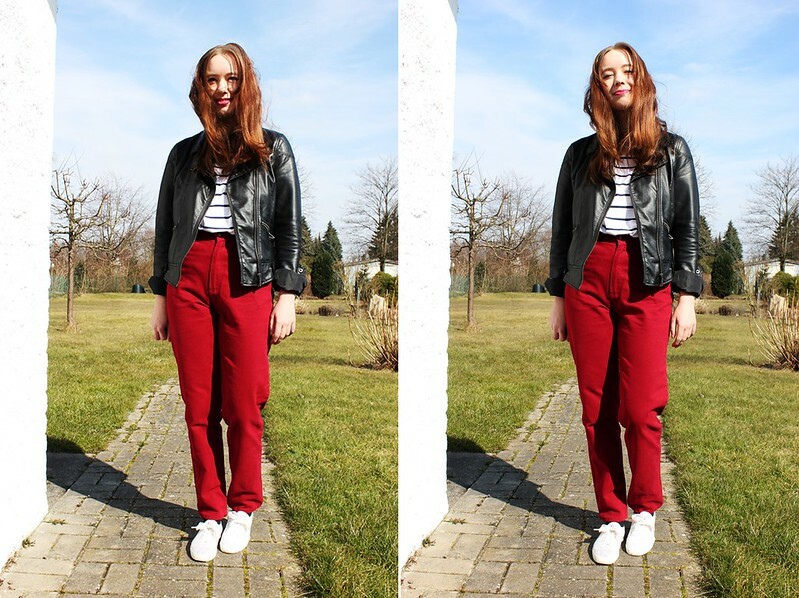 you have such great style, love the styling of your cute red jeans. Dein Look ist wirklich toll!!! Mag ich. Ich finde deinen Blog echt super und interessant !